LabEquipmentsManufacturersIndia is a trusted structural demonstration models manufacturers, suppliers and exporters in India. 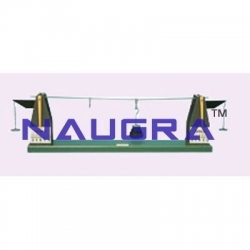 We deals in broad range of structural demonstration models at competitive prices around the world. Our structural demonstrator models are widely used in various engineering colleges, universities, vocational training lab and research labs to train and educate students. Some of our high quality structural demonstration models are displacement fixing moments, moment distribution coefficient, fixed end moments, maxwell betti theorems etc.